There’s nothin’ more inviting on a hot summer day than a cool dip. And that can lead to trouble if your pool lacks a child-proof fence. Installing a fence around your swimming pool is a smart security measure that prevents kids from having unsupervised access. In many areas, the law and your insurance company may also require it. But how do you know what kind of fence to pick? The U.S. does not have a federal pool fence law. Instead, pool barriers are regulated at the state and local level. Wait, it gets more complicated. There are exemptions built into these laws. For example, families with children over 6 years old don’t have to install a pool fence in Arizona — unless you live in Scottsdale, Glendale, and several other areas. See what I mean? It’s confusing. Then you have to consider that although your pool might be exempt from fencing laws, your insurance company might require it. Height: Some areas require a 4-ft. fence; the CPSC recommendation is 4 ft. or taller. Structure: Must be impossible for children to climb. Type: Permanent fencing is ideal because of durability. Materials: Structures can be made from a wide range of stuff including wood, vinyl, and aluminum. However, make sure the material you pick is not easily susceptible to damage. 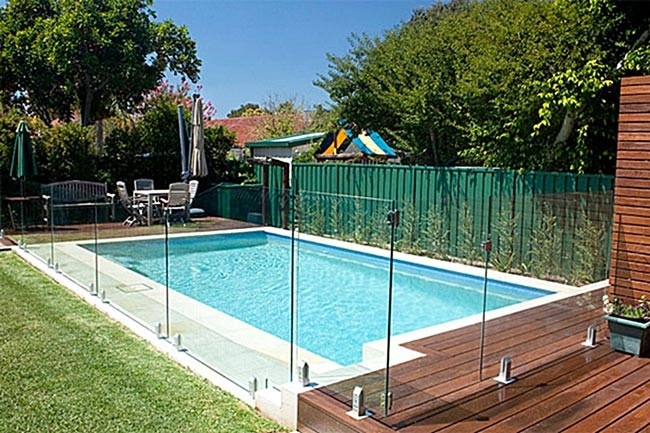 Removable mesh pool fencing: Many consumers like this option because it’s an easy-to-move transparent barrier. But when it comes to safety, don’t skimp. The Association of Pool & Spa Professionals has set a standard for fences like these that is recognized worldwide. Here in the U.S., it has the approval of the American Society for Testing and Materials. So if you go with a mesh barrier, make sure it meets or exceeds the ASTM requirements. In many areas this is also mandatory by law. Vertical bar fencing: Structures can be made from a wide range of stuff including wood, vinyl, aluminum, and wrought iron. However, make sure the material you pick is not easily susceptible to damage. In most states, the space between the vertical bars can’t be more than 4 inches wide. Glass panel fencing: Barriers like these are very popular in California. They are durable and safe because they’re made from tempered glass. Plus, since they're transparent, they don’t detract from your pool’s beauty. Keep in mind: Many states, such as New York and California, require layers of protection in addition to fencing. How did we find stuff? We Googled "swimming pool safety" along with the name of our county and state. To see a wide range of security features and measures to make your pool as safe and liability-proof as possible, check out this video by the National Drowning Prevention Alliance, in conjunction with the CPSC.